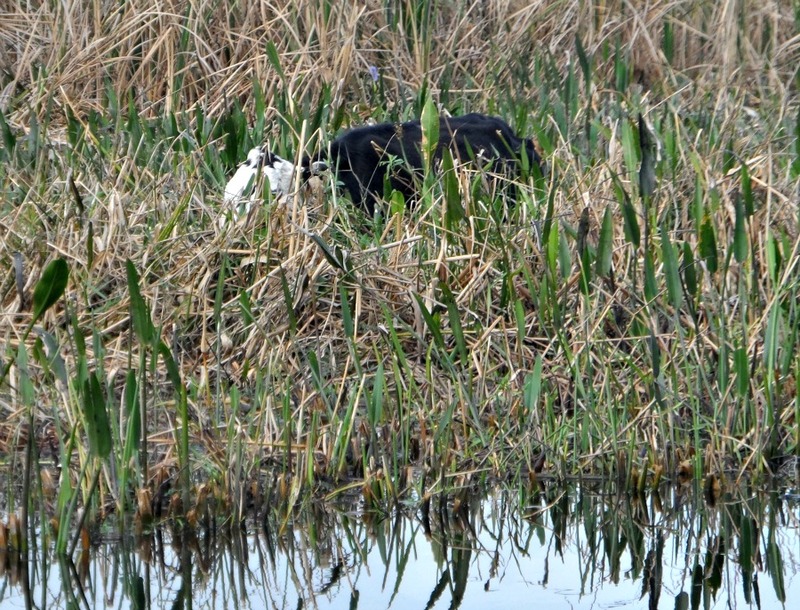 While on our air boat tour we saw a lot of wild cows grazing in the marsh. And I mean IN. 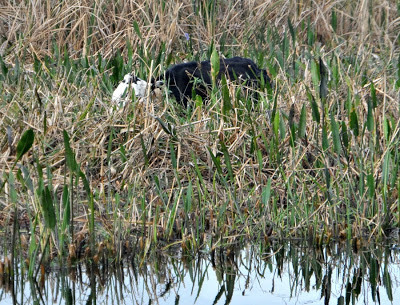 Apparently these cows are descendants of cows brought to Florida by Spanish and then British settlers and were let free to wander and graze during the various wars that occurred during the early years of settling Florida. 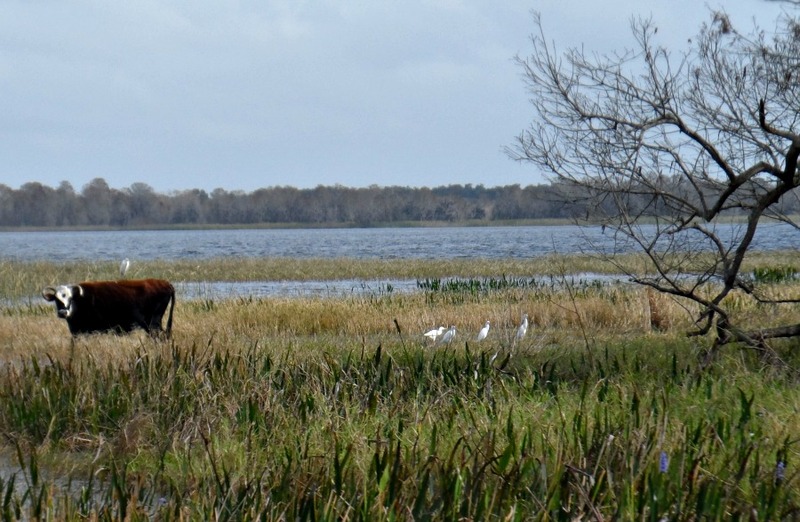 Today they are owned by the large ranches that dot the prairies in this part of Florida but are still permitted to graze freely in the marsh. 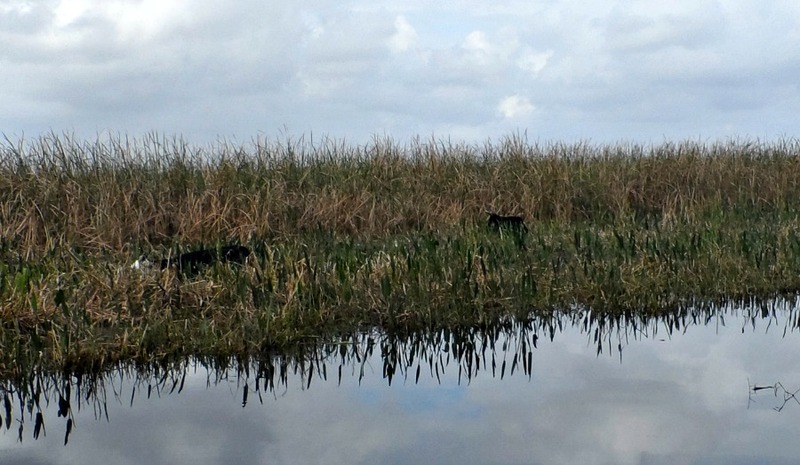 Once a year they are rounded up, the males are separated out for market and the females are returned to the marsh for another year. The story about the cows really intrigued us and when we learned that Lake Kissimmie State Park brings Florida's cowboy heritage alive with living history demonstrations of the early Florida "cow hunters" in an 1876-era cow camp we had to go and have a look. 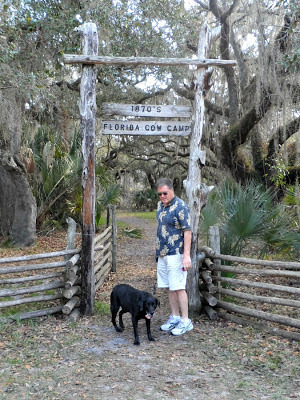 It was quite a hike in to the main area through a beautiful oak hammock. 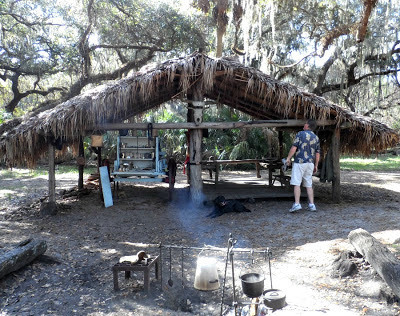 Cow camps were built in oak hammocks because the marsh often caught on fire - mother's nature' way of house cleaning - but the hammocks were always protected by an area of water the fire could not jump. On the way in signs introduced us to what we were about to experience. 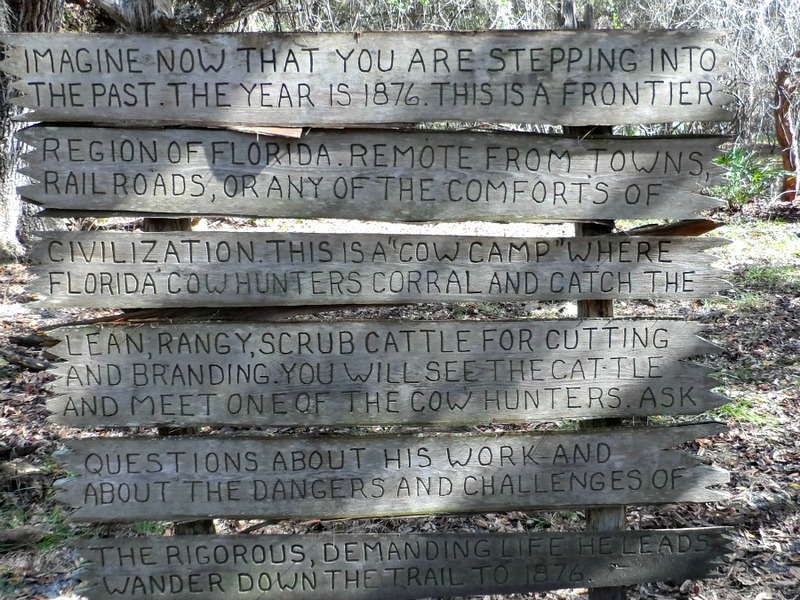 The cow camp consisted of a shelter for the cow catchers, a corral for the cows and a separate one for the cow catchers horses. The shelter is called a chickee and was most commonly used by the natives in Florida. It is built to face the wind with the fire in front so the wind blows the smoke into the chickee chasing out the mosquitos. Note the whip to his right. 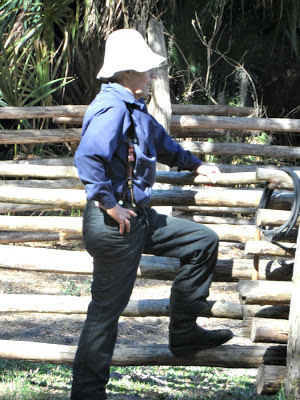 This is used to round up the cattle. They whirl it around and "crack" it. 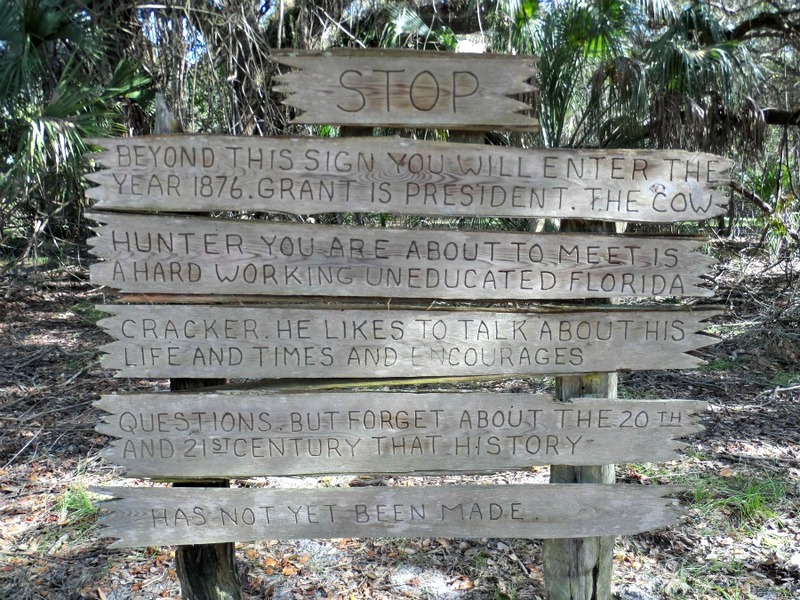 Makes a very loud popping noise - like a gunshot - the real origin of the term Cracker. Never is an animal touched with the whip. It would do too much damage. As a point of interest. 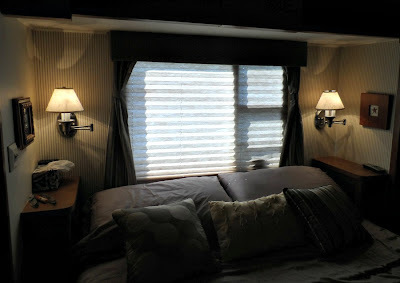 two weeks ago we ordered new lamps for beside our bed from Camping World. They came in yesterday so we went to pick them up. 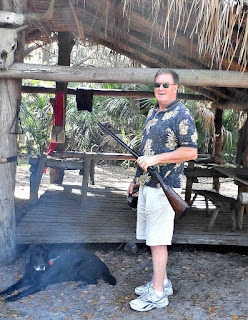 While there we noticed two RVers in the parking lot hooking their car to their motorhome using a Blue Ox tow bar, Arch was interested in how it works and went to chat with them. Meet Jim and Bettye Hatch. 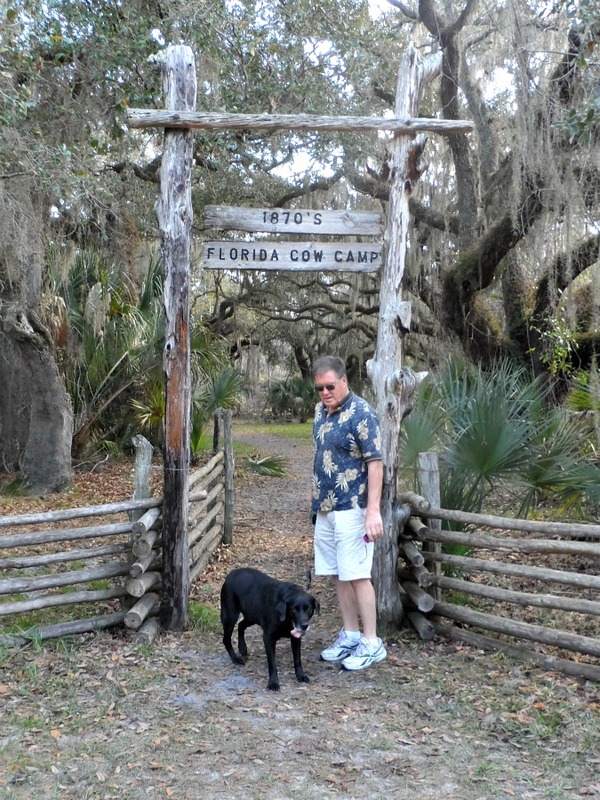 Very delightful people and Jim is a Florida Cracker - ie the descendant of the original Florida cow catchers and ranchers. 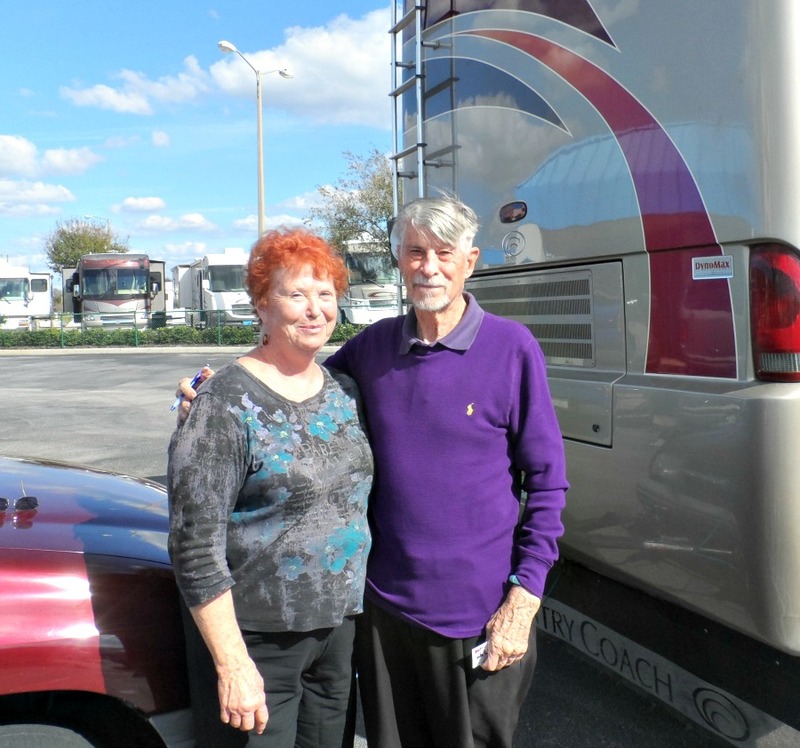 Jim and Bettye have a home on a lake in Babson, Florida they would like to rent, which is not far from us here in Avon Park. 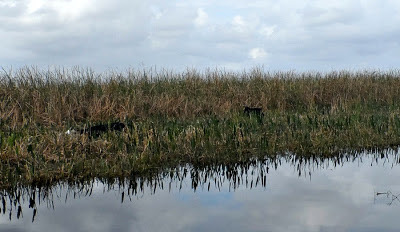 A great, central area to explore Florida and visit Disney World, etc. $900 a month on a yearly basis, $1200 per month if seasonal. If you are interested let me know and I will put you in touch with them. And the new light look great don't you think?